Oh hot wings, they’re always such a roll of the dice, but I can’t resist. I guess I have a bit of a chicken wing gambling problem. I love Junior’s so I thought I would try their recent menu addition. 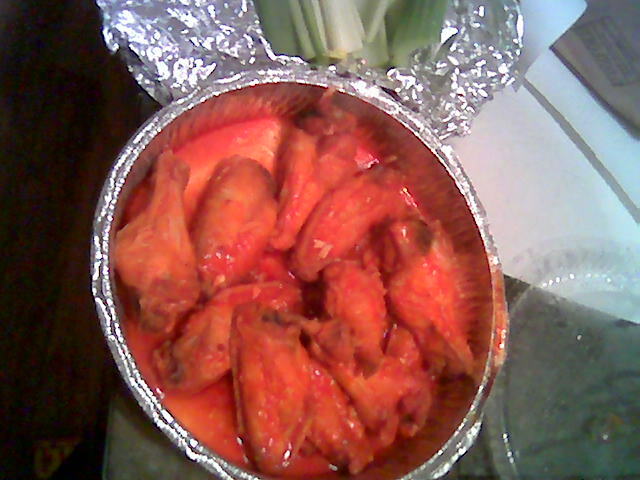 Lots of celery on the side, but they forgot my side of blue cheese, which by the way I like for the veggies, not for the wings. Immediately after taking of the lid of the take-out tin there is wonderful, buttery, spicy, garlicky?! aroma. I could also see by the texture, these wings do not pass the two rules of chicken wing cooking, and tasting confirmed that. The wing sauce is an interesting take on tradition hot sauce, the butter was well represented here. Until recently I didn’t know that butter was a component of hot wing sauce. Fresh garlic made up for the lack of traditional vinegar zing, I like this sauce a lot. However Junior’s needs to stick to their day job of awesome pizza and Italian food. Also in Junior’s news, they have a new downtown Burlington Vermont location, home to the former Dunkin Donuts. Per the Junior’s website, the downtown location will open April 1st. I believe a dozen wings were $8.99 pre-tax.